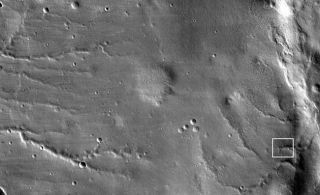 HiRISE took this first test image from orbit on March 24, 2006, from an altitude of 2,489 kilometers (1,547 miles). The scene covers an area 49.8 kilometers (30.9 miles) wide and 23.6 kilometers (11.7 miles) high, of landscape typical of Mars' mid-latitude southern highlands. Mars Reconnaissance Orbiter (MRO), has relayed spectacular testimages using its super-powerful camera leaving mission scientistsand engineers more than pleased with the initial imagery. "Thequality of the images is fantastic!" HiRISE principal investigator AlfredMcEwen, of the University of Arizona, told SPACE.com. "This demonstratesthat both the HiRISE camera and the spacecraft pointing performed superbly." Afterthe test shots using HiRISE wrap up on Saturday, the camera will be turned offwhile the spacecraft "aerobrakes" - a technique wherebythe MRO spacecraft repeatedly dips into the upper atmosphere more than fivehundred times to scrub off speed. By doing so, the spacecraft will drop intosuccessively more circular orbits. MRO launched on Aug. 12 of lastyear. It reached Mars and began orbiting thered planet on March 10. "Peoplehave been saying 'oooh' and 'ahhh' a lot while examining the first images," saidLoretta McKibben, a spokeswoman for the HiRISE operations at the University ofArizona in Tucson. Theorbiter is hauling an array of science instruments, including a radardevice designed to probe the subsurface of Mars for layers of ice, rock and,perhaps, liquid water that might be accessible from the surface. NASA's MROis on a quest to find supportive evidence that water persisted on the surfaceof Mars for a long period of time. While other Mars missions have shown thatwater flowed across the surface in Mars' history, it remains a mystery whetherwater was ever around long enough to provide a habitat for life. Equally happy about HiRISEearly images is Jim Graf, Project Manager for MRO at NASA's Jet PropulsionLaboratory (JPL) in Pasadena, California. Earlier,Graf told SPACE.com that other MRO instrumentation will undergo checkouttoo. These are the ContextCamera (CTX) that provides wide area views of Mars terrain to help scientistsappreciate the context for close-up photos, as well as a trial-run of the MarsColor Imager (MARCI) - a weather camera that eyes clouds and dust storms. Another keyinstrument on MRO is to be turned on later today - the Mars Climate Sounder(MCS). Getting this instrument to the red planet has been tough-going. The deviceflew on the ill-fated Mars Observer that was lost just before Marsarrival in August 1993. Then it was onboard the metric-challenged mission ofthe Mars Climate Orbiter that was lost in September 1999when one engineering team thought metric while another figured in Englishunits. DanielMcCleese is the principal investigator for the MCS, a scientist at the JetPropulsion Laboratory (JPL) in Pasadena, California. He told SPACE.comthat MCS will be powered on this evening as MRO is near apoapsis - that's thefarthest the spacecraft now swings by Mars. At thattime, a brief period of taking test data with MCS is slated. The device will beturned off as MRO nears periapsis - a part of its orbit that brings the probeclosest to the red planet early Saturday, McCleese explained. MRO is alsoflying the Compact Reconnaissance Imaging Spectrometer for Mars - CRISM forshort. The instrument is another high-tech detective that will help seek tracesof past water on the Martian surface. It isn'tgrabbing images yet, as its cover is still on. But the testing has gone well,advised Michael Buckley, a spokesman at The Johns Hopkins University Applied PhysicsLaboratory (APL) in Laurel, Maryland. The APL-ledCRISM team conducted three successful checkouts of the instrument during thecruise to Mars. According to APL's Scott Murchie, the principal investigatorfor the instrument, the device is working very well. Thissummer, the CRISM team will continue planning for the next round of spacecraftcheckouts and instrument calibrations -- which begin when MRO's aerobrakingphase ends in September -- and refining the software it will use to operate theinstrument and collect data. "In fact,we expect the first data - images -- in mid-September, when the cover isopened," Buckley told SPACE.com. Followingseveral months of aerobraking to achieve a circular, polar orbit, MRO willbegin its primary mission starting in November 2006 and run through November2008. The primary mission is followed by a communications relay phase,currently planned to run through December 2010.